The Lantus insulin is a long acting agent, designed for up to 24 hours at a time, as well as an agent to control the blood sugar levels in the patient. This medication is produced from a form of human insulin. An individual that is prescribed this medication should not mix with any other insulin solutions. This type of insulin is usually prescribed for adults as well as children with type 1 diabetes and for adults with type 2 that need insulin along with their pills. The doctor will explain how the medicine should be administered. Nevertheless, the Lantus insulin is known for its one-a-day dose. To achieve the proper affects, the medicine should be taken approximately the same time each day. This insulin comes in vials as well as cartridges. Children as young as 6 years old can take this medication without diverse effects. However, children under the age of 6 have not been studied and should not be used. Discuss this medication with an individual’s doctor or the child’s physician. It is vital that this medication is administered with an injection under the skin only. 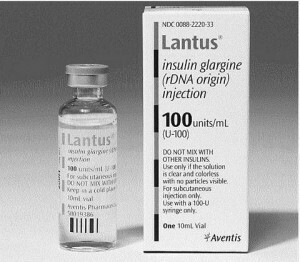 The Lantus insulin is too powerful to be pumped directly into the vein. Adverse affects could be devastating. The liquid needs to be clear and colorless. If this is not the case, discard and open a new package. All unopened packages should be placed in the refrigerator. After the package has been opened, refrigeration is an option. Nevertheless, keep the medication away from heat and light sources as well as in temperatures of less than 80 degrees. All needles and insulin should be kept out of reach from children and animals. There is information that an individual must know before using the Lantus insulin. A person needs to discuss with their doctor questions or concerns before this medication is taken. The physician in charge of the patient will explain in detail everything they need to know before they begin. It is important that the injection site is different every time. This is because the skin may begin to develop thickness or bumps. Changing the location will allow the skin to heal properly. Diet and exercise is important to maintain a healthy lifestyle. An individual can discuss with their doctor or diabetes’s specialist with the proper regiment they should take. Every body is different and reacts to various routines. An individual needs to communicate their desires with the professional. Side effects are rare but should not be taken lightly. Several long term effects can be present if the proper medical treatment is ignored. Allergic reactions are rare but the most common. A system reaction can be shortness of breath, rash, rapid heartbeat or dizziness. Seek a doctor right away if these are apparent. Redness, itchy skin or swelling at the injection site may be only temporary. If this problem lasts for a couple of days, make a doctors appointment right away. Any issues that seem to be unknown happen after an injection; a call to the doctor may be in order. Do not reuse needles. These need to be disposed of properly. The medical care provider can explain exactly what needs to be done. Do not take the Lantus insulin when low blood sugar is apparent. Test the levels frequently. If the glucose levels are under the recommended range, eat a piece of hard candy. Then wait 30 minutes and test again. If this has not helped, seek medical advice immediately. Alcohol lowers an individual’s blood sugar immensely. It is important to get a doctors advice before consuming a liquor beverage.